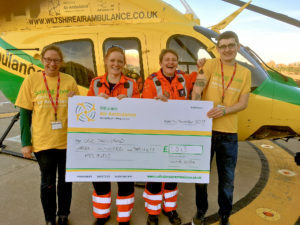 A MELKSHAM man who defied the odds to run 5km after being told by doctors that he may never walk again after a horrific car crash, presented a cheque for £1,313 to Wiltshire Air Ambulance for his efforts. Luke Dark raised the money by taking part in Melksham’s parkrun in August – the organised, free weekly 5km run held every Saturday at 9am in King George V playing field. Not one to rest on his laurels, Luke remains determined to raise more money for Wiltshire Air Ambulance, who he credits with saving his life in 2014 following the head-on collision with a truck that left him in a coma for six months.